Tieto Keilalahti Campus (formerly named Nokia House then Microsoft Talo) is the head office building of Tieto, located in Keilaniemi, Espoo, just outside Helsinki, the capital of Finland. The campus was built between 1995-1997 as headquarters for Nokia by architect Pekka Helin. It comprises three separate structures: The two most southern parts of the building were built in the early 1990s and the third, most northern part was built in 2000. Nokia operated in the building from 1997 to 2014, with around 5000 employees working in the premises. They owned the building up until December 2012, when it was announced that it had been sold to Finland-based Exilion for €170 million. Nokia continued using the building as its head office, leasing it on a long term basis. 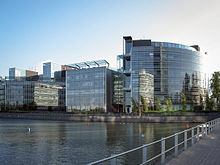 The building was transferred to Microsoft Mobile as part of the sale of Nokia's mobile phone business to Microsoft in April 2014, at which point the building was renamed Microsoft Talo (literally Microsoft House). Nokia subsequently relocated its headquarters to its former Nokia Networks offices in Karaportti to the north. In 2015 Tieto announced its intention to move its head office to part of the building, with the move taking place in early 2017. Microsoft Mobile closed down in 2017 when its assets were acquired by HMD Global, leaving Tieto as the sole occupier, and the building was renamed as a result. In December 2017, Exilion sold the building to Germany-based Deutsche Asset Management (part of Deutsche Bank) for 164 million euros. ^ a b c "Official: Nokia to sell and lease back of Nokia House". InfaTech. 4 December 2012. Archived from the original on 25 May 2014. Retrieved 15 January 2016. ^ "Fun fact: HMD Global has headquarters next to Nokia". Nokiamob. 2016-04-12. Retrieved 2018-01-11. Wikimedia Commons has media related to Microsoft Talo. This page was last edited on 1 February 2019, at 00:57 (UTC).